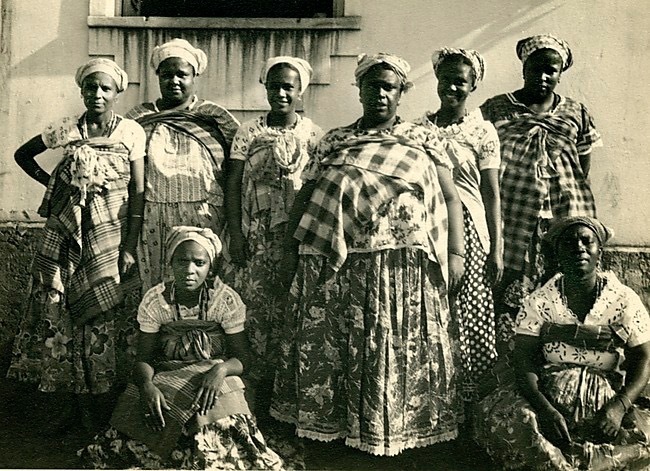 The Gullah and Geechee living in the South Carolina Lowcountry established a new culture, merging the languages, customs and lifestyles of the various Africans brought enslaved into the Low-country and absorbing the regional American experience. 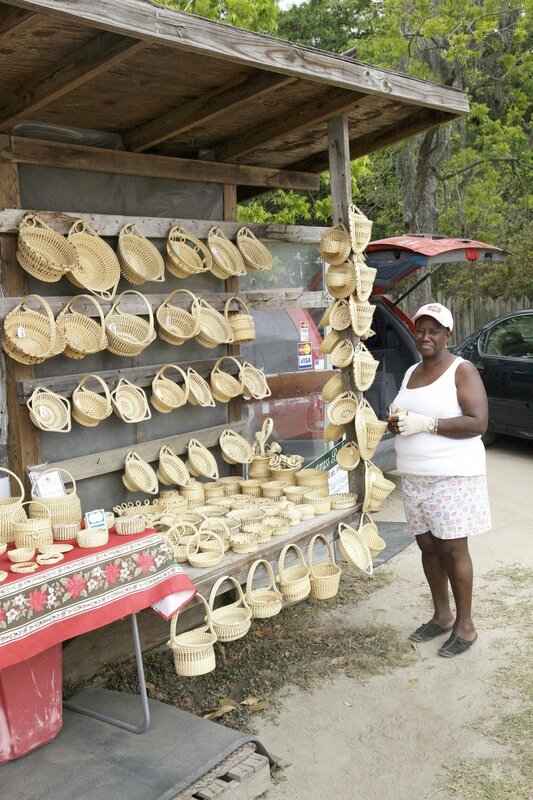 These traditions remain intact on the isolated barrier islands their ancestors settled at the time of emancipation. The Corridor recognizes the important contributions made to American culture and history by Gullah Geechees who settled the coastal counties from NC to FL; assists governments, public and private entities in SC, GA, NC and FL in interpreting the story of the Gullah Geechee and preserving their folklore, arts, crafts and music; as well as identifying and preserving sites and historical data associated with the Gullah Geechee for the benefit and education of the public. Participating artists will explore how notions and byproducts of ethnicity impact individual and collective identity, the racial constructs that orchestrate histories, and individual’s will to belong and to identify with community. Gullah is a language originating among residents of the coastal southeast. A combination of African and European vernacular, it began as a means of communication between European slave traders, slave owners and varied African ethnic groups. The African creole dialect still appears in vocabulary and speech patterns of the South today. 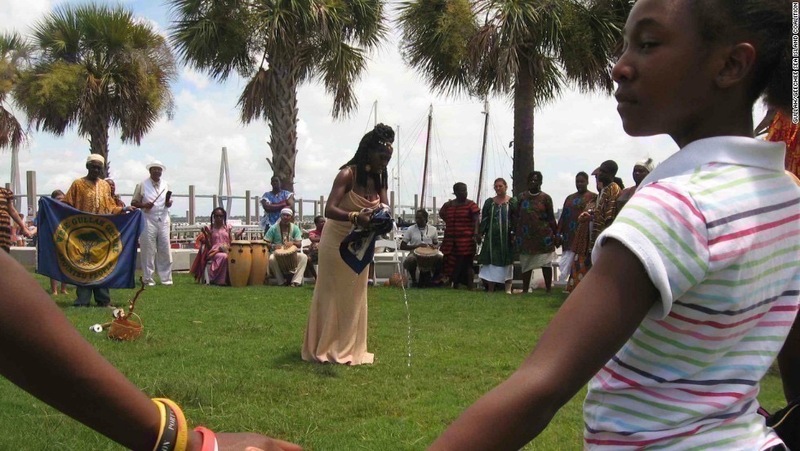 Today, Gullah-Geechee tradition and culture is still alive in the Lowcountry. 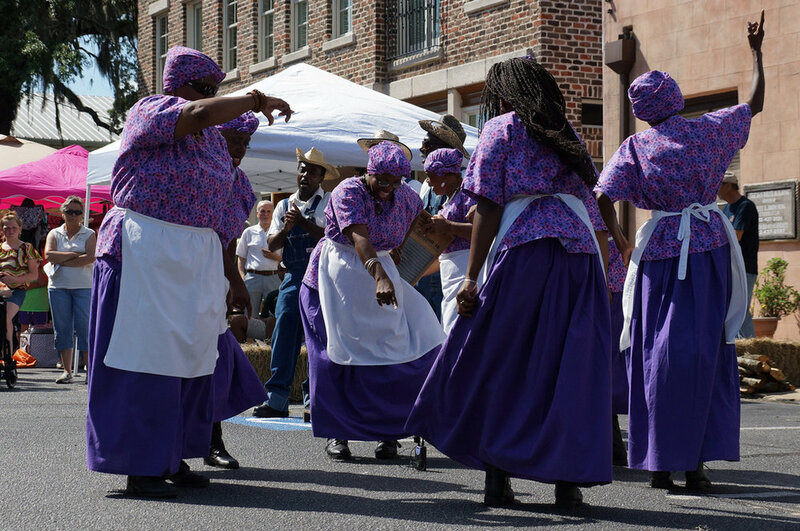 Descendants of enslaved peoples carry on traditions of language, spirituality, cuisine and art forms passed down for generations. Sweetgrass baskets have become a widely-celebrated and identifying facet of coastal South Carolina. The hand-made baskets were originally used to carry rice and other cash crops. The practice has transcended centuries to become a cherished decorative addition to homes of the region’s residents and visitors. Artists make and sell their baskets in Charleston’s City Market downtown and along Highway 17 in Mount Pleasant, South Carolina. The impeccable craftsmanship and artistry of the basket-making tradition is highly-respected by Charleston-area locals and tourists alike. The rich culinary tradition of the Lowcountry has been profoundly influenced by Gullah cuisine. Prepared with regional resources like seafood, rice, grits and okra, the fare combines local ingredients with West African technique passed down for centuries. Given that enslaved people began cooking for white southerners in colonial-era homes, Gullah contributions to contemporary cuisine throughout the region are undeniable. Today, Charleston’s high end restaurants boast Gullah-inspired dishes like shrimp and grits, fried triggerfish and okra soup. Soup mixes are a staple of Charleston City Market today, once sold to post-bellum housewives as a convenient means of meal preparation. The commercialization of the term “Gullah” has problematic ties to colonialism and slavery as white entrepreneurs profit in Charleston’s tourism industry by selling Gullah-inspired products not prepared by Gullah hands. Authentic Gullah cuisine prepared in local “hole-in-the-wall” restaurants and in the homes of its descendants continues to be a central part of keeping the culture alive. Agriculture has been the base of South Carolina’s economy since the settlement of the American colonies. The native Americans grew beans, pumpkins, onions, melons, and maize, and British colonists brought indigo, cotton, tobacco, ginger root, cattle and hogs.In 1685, rice was bought to South Carolina from Madagascar, and the commercial production of Carolina Gold rice took off from there. Planters developed a highly effective hydraulic system for flooding and draining the fields. By the time of the American Revolution, settlers were exporting 66 million pounds of rice a year. Indigo became South Carolina’s second most important early crop. Indigo production merged nicely with rice production on many plantations. But when that market dried up, planters shifted to cotton. Sea Island cotton, which had long, fine, strong fibers, was favored in both English and American markets. After the cotton gin was invented in 1793, cotton completely replaced indigo as the major crop of South Carolina. 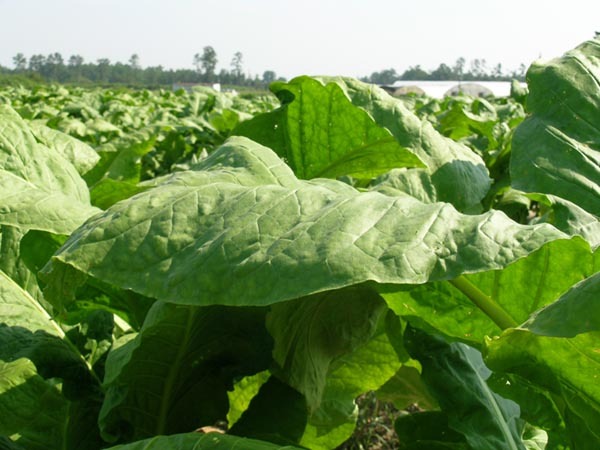 Agriculture was the primary economy for the southeast during colonial times. Wealthy aristocrats settled the area and established plantations as a means of income. Plantation owners used slave labor to cultivate cash crops like cotton, tobacco, rice and indigo. 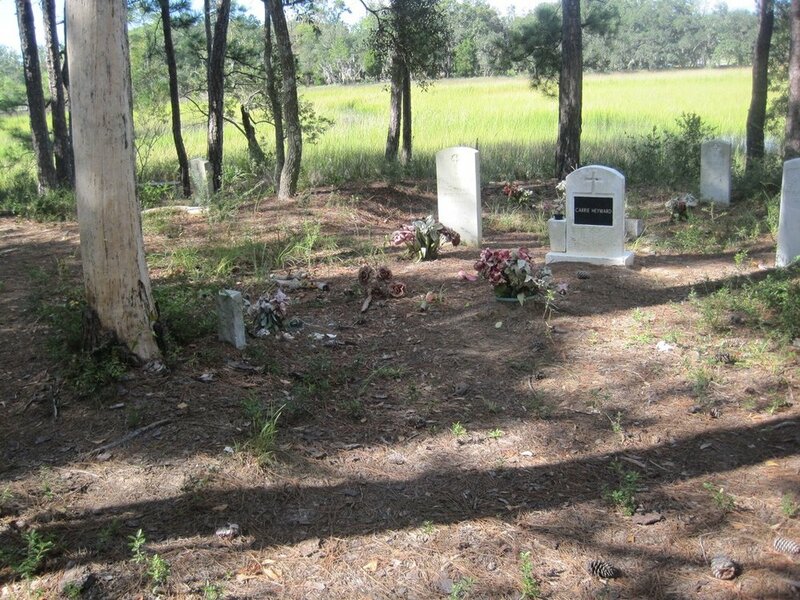 The Gullah people’s expertise bore a flourishing commercial agricultural industry that echoes throughout the Southern economy today. Contemporary Gullah farmers grow a variety of crops like rice, collard greens, peppers and tomatoes as a means of both sustenance and income. Black-owned farms in the region like the Joseph Fields Farm in John’s Island, South Carolina and the Freewoods Farm in Burgess, South Carolina work to preserve their agrarian roots and nurture their connection to the land. The art of sewing sweetgrass baskets has been passed down from generation to generation, from mother to daughter, through the Gullah community who descended from those West African slaves. Originally designed as a tool for rice production, the sweetgrass basket has evolved to a decorative art. Today, sweetgrass basket sewing remains an integral piece of the cultural fabric of Mount Pleasant. To mark the legacy and artistic contribution of the baskets and their creators, the seven-mile stretch of Highway 17 was designated the Sweetgrass Basket Makers Highway.